This coffee will be fresh roasted for you. 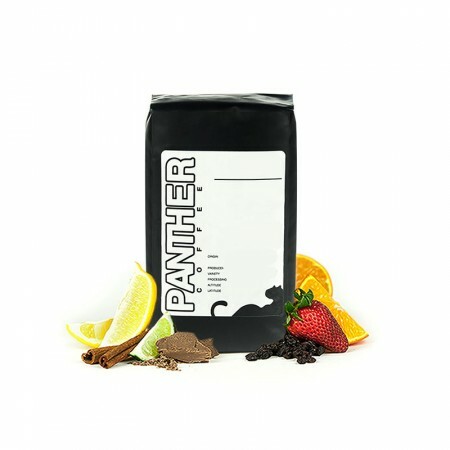 We expect Panther Coffee Roasters will roast and ship this coffee in 1-2 business days depending on their roasting schedule. This is the Nicaragua Finca La Amistad brought to you by Panther Coffee Roasters. This fully washed coffee was grown by Francisco Javier Valle Garcia in the Las Cuchillas, Jinotega region of Nicaragua at 1,200 meters above sea level. We love this coffee for its nuanced notes of chocolate, black cherry, and clove finish. Delicious as advertised. Loved this selection. Very good coffee. Balanced with a nice amount of sweetness. It lacked uniqueness to some degree, but it was still good for what it was. Just one simple base note made up the entire profile of this coffee. It was smooth and simple, much like a quality Merlot, just in coffee. A step in the right direction for my tastes over the Etheopia Hambela Buku, but a little boring. Not so flavorful; the flavor I do taste is a little too bitter. Not as bright as one would expect. Off notes from Cataui, and it was nearly a full city roast. Tried a single cup on v60, 21g to 350G water. Remained will be used for my garden, or gifted to office. Tasted a little to burnt and robust, a litter darker than I would like, but still good! Say Nicaragua, but we received a blend from ethiopia that wasn't very good. I made this one on cold brew and really enjoyed it. very smooth coffee I've given five stars or how much of apleasure it is to drink despite its being outside of my flavor preference. It's so smooth, with a chocolate subtlely that pleases. While this coffee made a good cup, none of it's flavor profiles really stood out to me. Ran it through an aeropress daily and wasn't able to get the mentioned notes in the cup. Unfortunately, this was my least favorite coffee I have received from MistoBox. This is not to say the coffee is bad, its still quite good, but not my favorite flavor. It has a slight coppery taste along with very subtle flavor notes. Nothing about the coffee stands out, so I unfortunately had to give it at 2 star "meh." Lets try a Kenyan from either Verve, Spyhouse, or Metric! I really enjoyed this coffee. This coffee has a very flowery scent when you smell the unground beans and then more so when you grind them. The flavor to me was uniform - but not in a bad way. I didn't pick out huge varieties of complex flavors like I have with some roasts, but rather, a very pleasing over all taste that reminded me of a nutty baked bread, like maybe a datenut loaf or banana bread. The aftertaste is much lighter and clearer, with that sense that I call "round" and "light" and "bright" but for which I still haven't found the suitable official coffee-tasting term I've been seeking. And finally it has a little spicy, sweet, snap to it at the very end. All-in-all, a very pleasant, very drinkable coffee. First few cups I wasn't too sure how I felt about it, but I switched from a Chemex to a Melita pour over and the tasting notes really came out. It's interesting--this coffee doesn't have a strong aroma as whole bean, or after it's been ground, and yet it doesn't lack defined flavor notes after it's been brewed. Excellent coffee. Next coffee, could we do an Ethiopia from 1000 Faces (Chelbessa) or something along those lines? I enjoyed this coffee but not as much as I was hoping, it's a pretty sour cup that masks a lot of the flavors did not get much fruit forward notes, more caramel and earthy tones. I enjoyed this coffee, but not nearly as much as the topeca San Lorenzo. It seemed like a bit darker roast than what I'm looking for. Still enjoyed every sip. Some nice sweetness and fruit at the front, but the finish is very roast-y and the lingering burnt notes distract from the coffee's good qualities. The caramel and subtle fruity flavor is perfection. This might be the best cup of coffee I've ever had to this point. Wow! Yes! My mouth just keeps saying "yes please, yes please!" Didn't find the flavor to be as complex as the previous coffee. Maybe that's what "bright" means? Lovely, sprinted through this bag--so clean and nutty! This bean was nice, but overall the caramel notes were a little intense for my pallet. This coffee had bright sour notes. Not a bad sour but a little bite on the tip and sides of the tongue. It had a unique (to me at least) aroma, I can't put it to words. Not bad, but different. In a French Press, I tasted nutty notes and it was less sour than in a pour over. Overall a good coffee. Oh man, just the smell of this coffee is enough to get me hyped in the morning!! I enjoyed this coffee - mild and sweet, it is a very drinkable coffee. This is a great "everyday" coffee. The roast was a little darker than I enjoy. A bit too many high notes for my taste, but once cooled, has a very nice assortment of flavor. Enjoy this cup slowly. This coffee has a very distinct taste of raisins and band-aids (or rather the way band-aids smell). I am not a fan at all. The acidity is not present and the flavor profile is god awful. Interesting to discover I had this coffee in the past and didn't care for it. This batch is quite good. A bit dark by appearances, but nicely balanced with a clean finish. Breaths of apricot and a very light texture with low acidity, Nicaragua Finca La Amistad makes an easy morning cup. I would dispute that it could be better, but because we did not do a pour over, as we are of the French pressers, the sour cherry came through strong as the last drops coats your throat with each sip. Delicious refreshing coffee when cold brewed. This pick was kind of flat for me actually. I tried it with my chemex, kanta pour over and standard dripper.The pick after this one is really good. Used a V60 to brew this and wasn't thrilled about it. I guess I was comparing it to Gera from Topeca and the El Tashi from Augies, which is probably not fair.